I had a post involving beer all set to go, but I had a bit of a traumatic experience today, so I’m going to talk about that instead. I won’t go into details, on the vanishingly small chance that the responsible parties might read this, but during a meeting for the ol’ day job, I was told to “synergistically onboard people to grow my network.” Now, that wasn’t all that bad, though one could argue that verbing a propositional adjective phrase is more troublesome than the standard verbing of nouns. And obviously, one “builds” networks from all these onboarded people, one does not “grow” them. And clearly, in this context, “synergistic” is meaning-free, so the speaker would have been better off substituting it with some foul piece of profanity just to jazz things up a bit. But I can handle all that, and better writers than I have complained extensively about such things. No, what stuck in my mind was a few seconds later, when I was instructed to “bootstrap them through the network”. As frequent readers will know, I’m basically a descriptivist, and I can chuckle indulgently (albeit through clenched teeth) at people who somehow think that using a perfectly serviceable phrase like “bring in” or “find” is boring and feel the need to spruce things up with a rather opaque and clumsy word – such is the price of low self-esteem. But these theoretical frequent readers will also know that the misuse of metaphor really grinds my gears (so to speak). So let us explore “bootstrap”, in case any managers happen to be reading this. It’s a word that probably wouldn’t get much use these days, since boots that have them are less common. But in brief, it is that little strap at the top rear of, say, a combat boot, or on either side of the top of a cowboy boot. 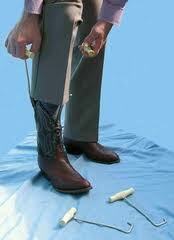 In a non-metaphoric sense, they are used to help a person pull on their boots, possibly using a boot hook. The primary metaphor involving bootstraps is “to pull yourself up by your bootstraps” – in other words to get into or out of a situation using only the resources at hand, with no outside help. This, of course, led to all sorts of secondary metaphors, such as “bootstrap loading” (or “booting”) where hardware kicks off the initial software being loaded onto a computer, and “bootstrapping” a set of data by resampling from it over and over to obtain better estimates of summary statistics. The point being – once you get outside the concrete world of actually pulling on boots, anything involving bootstrapping, by definition, can’t involve outside intervention, no matter what. So telling me to “bootstrap” someone is not only not meaningful, it is precisely the opposite of meaningful. It has negative meaning, and I am slightly dumber for having heard it used thus. So I reiterate my plea: if you don’t know what a bootstrap is, just don’t use the word. Assuming we’re dealing with English here, we’ve got more words than we know what to do with, so a) there is no shame in not knowing what the odd one means, and b) there is likely a perfectly good alternative lying around ready to be used. ~ by smwilliams on April 23, 2013. Thanks be to the gods that no one at work tells me to synergistically bootstrap anything. I asked my husband if anyone at his job talks like that, and he said no one, except him. Then he wanted to take notes so he could use your colleague’s awesome stylings…divorce may be immanent. Or at least counseling with a good speech therapist. The interesting thing is that after an hour of that meeting, I couldn’t tell you much of what was said (I’m pretty sure I’m supposed to leverage something). I suppose that could be considered a useful feature, depending on how much content you actually had to talk about. Right – the less content you have, the more you can say about leveraging. Of course, I’m in the world of geography and public health academia right now, and it can be almost as bad, with specialized jargon that even I have trouble figuring out. Took me forever to figure out what people meant by “operationalizing” theories etc. But I suppose it’s useful for experts to talk to each other. It’s like shorthand. Or a secret code for the secret society. We should get some decoder rings. In my experience, academic jargon is about pointing out how clever you are, while management jargon is about hiding how clever you aren’t.